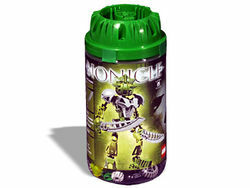 8567 Lewa Nuva is a BIONICLE set released in 2002. It includes Lewa in his Nuva form. Lewa wears the Kanohi Miru Nuva and held twin Air Katana that could alternatively be used as wings. Lewa Nuva lives in the jungles near Kauae Bay, keeping watch on Mata Nui from above. His swords can be used to clear obstacles – and when they are attached to his arms and legs, they form katana that allow him to soar above the island! Turn the wheel on his back to move his arms. 8535 Lewa became Lewa Nuva after the confrontation with the Bohrok swarms. Lewa's swords can be held in one hand, making a double-blade. Facts about "8567 Lewa Nuva"